WASHINGTON (CNS) — Pope Francis has named Archbishop Wilton D. Gregory of Atlanta as the new archbishop of Washington. "I join all who appreciate his pastoral abilities, his intellectual gifts, and his leadership qualities," he said in a statement. "I have known Archbishop Gregory for many years. In working with him on a range of pastoral initiatives and programs, I have come to recognize how generously he shares his talents and his love for the Church." In moving to Washington, the archbishop steps into a high-profile position. The area that comprises the archdiocese includes the halls of power in Congress, the White House, and the U.S. Supreme Court, the many embassies of governments from around the world, and nonprofit and lobbying organizations that advocate on a wide range of public policy issues. He also automatically becomes chancellor of The Catholic University of America's board of trustees. 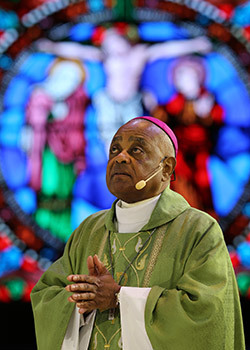 Archbishop Gregory has issued pastoral statements on the death penalty, euthanasia, and physician-assisted suicide and has published numerous articles discussing liturgy, especially within the African American community.